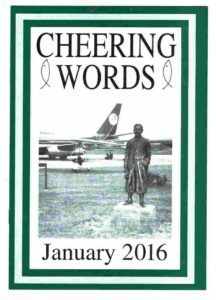 God willing, next year will see the 150th volume of Cheering, Words, a magazine commenced in March 1851 by Charles Waters Banks. One evening he heard words from the Lord, ‘Write cheering words for seeking souls’ and next morning he took up his pen, being not disobedient to the heavenly vision. Charles Waters Banks was pastor at Crosby Row Baptist Chapel, King Street, Borough and his return to the Religious Census that year shows a congregation of 400 at the morning service and 500 at the evening. Of several periodicals in which he had an interest Cheering Words is the only one still being produced. My copy of the second edition of volume 1 has on its title page the well known stanza, ‘What cheering words are these, their sweetness who can tell’. In the preface Banks tells of his purpose to send forth ‘a testimony for God’s truth apart from all sectarian peculiarities or party prejudices for lovers of a free grace ministry and suitable too for the poorest child of the Sunday School’. Though circulating mostly among Strict Baptist churches, it is described to this day simply as a monthly evangelical magazine with its appeal to old and young. The price in 1851 was a halfpenny (480 to £1) which made it the first half penny monthly ever to appear. The first volume contains the well known account of the Highland maid who was taught by the visiting minister the prayer, ‘Lord, show me myself’ and when that was answered, a second prayer, ‘Lord, show me Thyself’. Each editor in turn has left to his successor the accumulating annual bound volumes and the set is complete but for a few in the 1850s and 60s. By the late 1870s the cloth bound volumes embossed and gold blocked are a joy to handle. In 1879 a frontispiece is added, a photo of C.W. Banks and his 3 brothers, all of whom became ministers of the gospel. This feature continued in the following years. At first one pastor, then 2 and at length 4 pastors were portrayed on the page until 1939 when the war brought this remarkable gallery of portraits to an end. Banks continued as editor until his death in 1886. His successor was William Winters, F.R.Hist.S. and pastor of Ebenezer Chapel, Waltham Abbey, Essex. As well as continuing the existing content of short spiritual pieces, poetical pieces begin to appear and his interest in hymn writers led to a series of brief notes on many of them. Mr. Winters also began setting the monthly Bible questions for younger readers which has continued ever since. It had always been envisaged that there should be free copies of the magazine in addition to the subscribed copies and he established the Free Distribution Fund on a settled basis. His life was cut short on 23 July 1893 just before his 59th birthday. Mr. Benjamin John Northfieid, pastor of Providence Chapel, March, Cambridgeshire took up the editorship in January 1894 and continued to do so for 48 years until his death in May 1942. A Bible Reading Union was formed and suggested daily readings compiled by Ebenezer Marsh, pastor at Wellingborough, appeared for many years as the last page of the magazine. The jubilee of the magazine was marked in 1901, the January issue bearing a supplement with photos of the editors and publishers to that date. The publisher bears the financial responsibility for the magazine. Robert Banks was publisher from 1851-1885: his son Robert F. Banks was publisher and proprietor from 1886: Robert Banks and Son continued as publisher until 1919 when the name Marshall Bros. Ltd. is added in brackets. From May 1924 the sole name of Marshall Press Ltd. appears as the publisher. Mr. Charles Bernard Morton, pastor of Zion Chapel, Chatteris, Cambridgeshire undertook the editorship during those dark wartime days. In 1944 the premises of the publishers Marshall Press were severely damaged and the magazine was produced with difficulty. After a further year they felt they could no longer produce the magazine, so Mr. Morton took the step of asking if he could purchase the title and for the sum of £26 he became the publisher as well as the editor which is the arrangement that still applies. He continued to encourage chapels to have a quantity localised by adding their own outer cover with their chapel’s details, a facility provided at least as early as 1888. He also began to print the names of the young people who answered the Bible questions every two months. The present editor finds his own name among them and much to his surprise received at the end of the year a stand-up text bearing the words, ‘In quietness and in confidence shall be your strength’. (Isaiah 30:15) It stood on his bedroom dressing table for many years. By 1958 Mr. Morton’s health was failing and Pastor Fred Harris now pastor at Chatteris was editor protem for 1959. During that year Mr. Morton invited the present editor, by this time pastor at North Street Chapel, Stamford, Lincolnshire to take the editorship on. After prayer and direction received from the Lord he began in January 1960. He gave a sight of his first ‘copy’ to Mr. Morton, but after the latter’s ready approval, admitted that he was not’ fully satisfied with it – ‘I hope you never will be’ was the sage reply and so it has proved. The circulation at that time was just over 5000 copies monthly, several chapels having 50 to 150 copies and one taking 700 with their localised cover. With declining congregations large orders have dwindled, but the circulation approaches the same figure. In 1966 colour was added to the cover and the number of pages was in creased to 12. Monthly features have included ‘The story of the Stamp, God’s wonderful world, a chapel corner, poems and Bible questions for younger readers. By 1984 the magazine size was increased again to 16 pages and the page size was increased to A5. During the last few years Mr. J. Lancaster has kindly provided free A4 large print copies for readers with impaired sight. 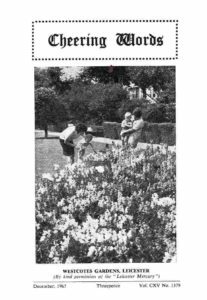 A week’s camp was begun in 1970 at Forest Fold, Crowborough, Sussex by the kind invitation of Mr. Stanley Delves and the church there, so that young readers might become acquainted with those from other chapels. The camp is an annual fixture which continues today. The Free Distribution fund continues to be very well supported and is the means of circulating copies to homes for the elderly, prisons and people in need at home and abroad as well as encouraging a wider circulation. The present subscription rate is £5.80 per year post paid and there is a sliding scale of reduced prices for multiple copies. We close this brief history with a desire above all to give glory to our sovereign, gracious Lord for his kind superintendence of the magazine’s usefulness and his providential supply for every need.